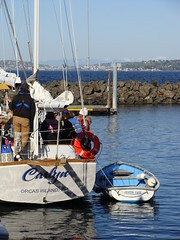 The majority of Salish’s programs occur aboard Carlyn,a 61-foot yawl built in 1996 according to the U.S. Coast Guard safety standards. 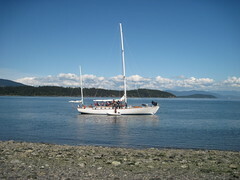 Carlyn belongs to Four Winds * Westward Ho Camps and is leased by Salish each year during the spring and fall. 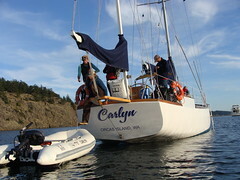 Carlyn is designed specifically to meet the unique needs of experiential education programs. 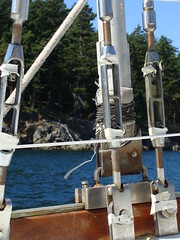 Her layout and rig are intended to allow maximum student participation in all sailing and science operations. David grew up messing about in boats with his dad on Lake Erie. He has worked professionally aboard nine different sailing vessels, four of them as captain, on both coasts of the US, in the Great Lakes, and in the Bahamas. David spent 13 years in Michigan as captain and program director of Windward Bound sailing camp programs where he managed youth volunteers throughout the year and led trips aboard traditionally rigged schooners each summer. When not working on the water, David enjoys doing carpentry and design projects. He studied Sustainable Building and Design at Yestermorrow Design School in Warren, VT. He recently completed the renovation of a 118-year-old home and designed two new homes which were built near Pontiac, MI. David studied Music at University of Miami and enjoys playing drums and percussion. 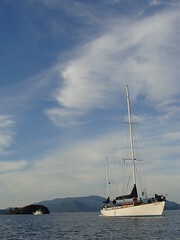 The Elettra III is an 85-foot steel hulled motor vessel originally commissioned by the Marconi Marine Company as a maritime technology demonstration vessel. The company’s founder, the famous inventor Guglielmo Marconi, was awarded the Nobel Prize in 1909 for his pioneering work in the development of the wireless technology which led to VHF radio and RADAR systems. Salish acquired Elettra in 2015 at a reduced sale price thanks to a generous in-kind contribution. 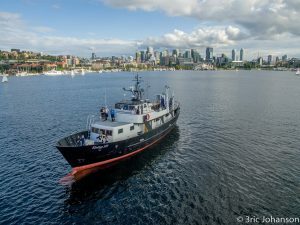 Salish is working closely with the U.S. Coast Guard for permitting as a Subchapter T Small Passenger Vessel. Supplementing the refit required for compliance and safety, we will be outfitting the vessel with the highest quality scientific and educational instrumentation, creating fully-networked classroom and lab spaces, and deployment arrangements. These modifications will enable us to safely and effectively deliver our unique, hands-on programs for classes a third larger than our current operations allow on a single vessel. For more information on Elettra III and plans for using the vessel in future programming, please contact Seth Muir at (206) 780-7848 ext. 1 or Seth [at] salish.org.